It was a pretty relaxed schedule where, between me and The Mistah, things got done and we still had bits of time to do with as we wished. And then we became parents. Depending on the day in question, some of those things might need to be done more than once….so lather, rinse, repeat as necessary. And then, once Libby started daycare, we had to fit all that in either before or after the end of the work day. I have to be honest, it has not been easy to maintain some aspects of our life to the same degree as we did before becoming parents. I don’t cook like I used to…gone are the days of leisurely preparing meals. I need to maximize the efficiency of what time I get in the kitchen and get food on the table. And sadly, the other casualty is the state of the house itself. We have tumbleweeds of cat hair rolling around the hard wood floors, multiplying like Tribbles; clean clothes mound up and take up residence in our bedroom instead of being folded, hung, and put away; and I swear the house itself has shrunk. We didn’t use to have a lot of clutter. But now piles and stacks and heaps have become the norm instead of the exception. And I’ve decided to stop beating myself up about it. Because these things are the result of choosing to spend time with Libby. Yes, I could put her in her crib and spend a weekend afternoon (or a Tuesday night) braising or baking, cleaning and organizing. But she is only ever going to be this age once. If I miss out on helping her discover the world around her now, I don’t get a second chance later. So maybe I choose to use a quiet weeknight after she’s gone to bed to sew her a bib instead of sweeping up tumbleweeds of cat hair. Don’t get me wrong, a clean, tidy house gives me inner peace. But seeing her wear her bib like a superhero cape and “fly” gives me way more joy. So, if you happen to pop in to say hi or we set up a date for you to come over for a leisurely visit, I ask that you kindly turn a blind eye to the state of my house. I’ll do my best to make things somewhat presentable. I may even manage to pull together a little something for us to nibble on. And I will most certainly try and distract you with adorable baby cheeks and squeals. BAH Note: I love Elena’s experience and tradition of hand kneeding the pimento cheese in a ziplock bag. Seriously, if I had luxury of time these days, I’d give that a try. And I totally see that becoming one of Libby’s ways to help me in the kitchen and introduce her to cooking. But right now, time is not on my side so I turn to the food processor. Whichever way you choose to make this delightful spread is perfectly acceptable. Serve on crackers, spooned into the cavity of a celery stalk, or eat right from the spoon. Much like my housekeeping choices these days, there’s no right or wrong, only what works for you. Using the shredding disk of your food processor, shred the cheddar. Dump the shredded cheese out of the workbowl onto a sheet of parchment, foil, or paper towel and replace the shredding blade with the regular blade. 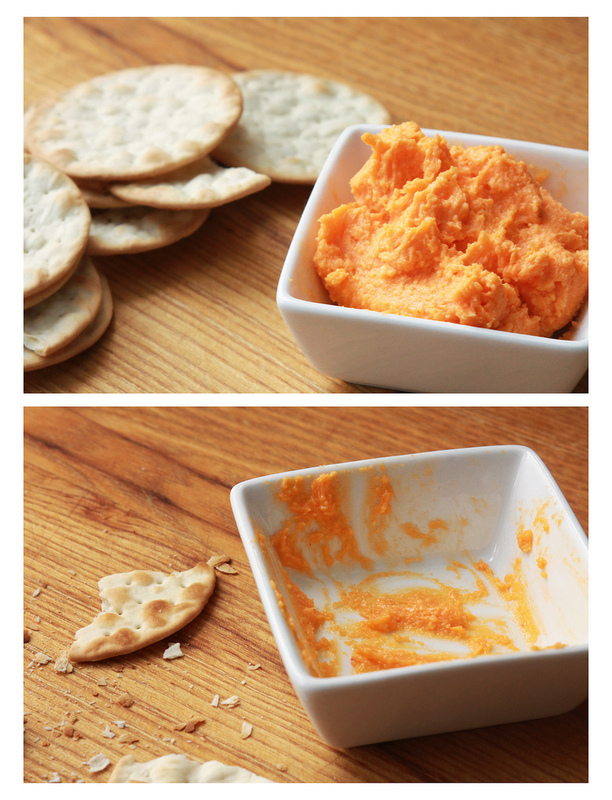 Return the cheddar to the food processor and add 2 tablespoons mayo and the drained pimento. Process, adding the additional mayo as necessary, until you reach your desired consistency. I’m sure everyone is way too focused on the cutie to notice the house! You’ve got your priorities straight. =) Eventually you’ll have time for the house, but having time for your wee one is so much more important. Wendi, my place is a mess too. Delancey and her stuff have taken over, and she just let’s us live here too. I’m glad you’re not beating up yourself about it because any clutter will eventually find it’s place, but as you said, Libby is only young once. When I saw this title in my inbox, I hoped the recipe from your twitpic would be here, and look at that, plus a sweet post, too! Enjoy every second of the madness. It goes by too quickly. I’ve never heard that rhyme before but it is spot on.� The dust isn’t going anywhere…I just need to be a little more zen about it. I plan on tailgating on my sofa this weekend for the game and pimento cheese is on my guest list! Look at you, blogging about food with a recipe and everything. Impressive! I seized the opportunity when it presented itself.� Besides, once I had the picture of the pimento cheese, I had to share. I’m counting on Her Royal Cuteness to provide guests with enough distraction that the state of the house will go unnoticed. Much belated congratulations! You’re focusing on what’s most important—the house can certainly wait. Thanks Tracy. I guess as long as the tumbleweeds don’t swallow us up the situation is not critical.